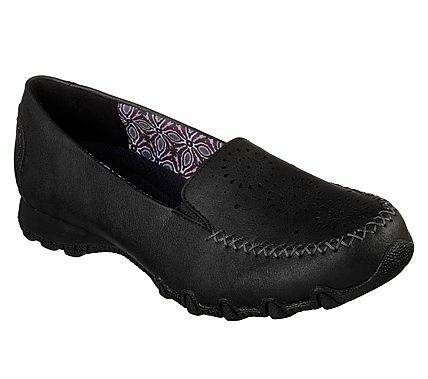 Feminine, detailed style meets supremely wearable comfort in the SKECHERS Relaxed Fit®: Bikers - Lass shoe. Smooth matte or metallic finish leather-textured synthetic upper in a slip on dress casual comfort loafer moc with stitching and perforation designs. Air Cooled Memory Foam insole.